As you've seen other places, this year for the Olympics Nike, Jordan, and Converse have joined forces for the United We Rise collection. Shoes for Lebron, Melo, and Wade feature the design on the back of the USA jerseys. Along with the shoes are a set of basketballs that feature the logos of each superstar, their company, and designs from the jerseys. Here is some more information on the ball below. Redemption is motivation enough for Dwyane Wade. Battling back from injury the past two seasons, and a disappointing performance from Team USA in 2004 in Athens, Wade has already helped turn this year's USAB team around. During the USAB Olympic exhibition tour, Wade led the team in scoring (18 ppg) and made several plays to remind us of the Dwyane Wade that was the NBA Finals MVP in 2006. 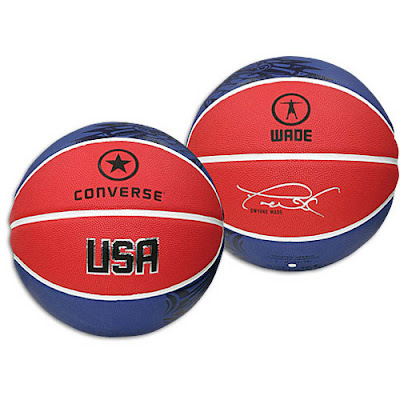 To celebrate Wade and USAB trying to reclaim the throne as the top team in the world, Converse has issued a limited edition "United We Rise" WADE basketball. It features the "United We Rise" veneered graphic, as well as Dwyane Wade’s lasered signature. The limited edition ball will retail for $30 and will be available at Eastbay.com, Niketown, and select Champs. You can find the ball at Eastbay and Champs. You can also find the United We Rise Dwyane Wade Team Signature shoe at Eastbay, Champs, and Niketown. Big thanks to the fine people at the Converse Basketball PR team for sending me this beautiful basketball. I don't even want to take out of the box, which also features the design from the USA Jerseys. Everyone is talking about the way Team USA took down China yesterday, but what seems to be overlooked is Dwyane Wade's performance. Articles will tell you how he led Team USA in scoring, but he did while shooting 100% from the field and the line. I know it's just one game, but every game I see him play this summer he gets better and better. This upcoming season is going to be a blast. Thanks for stopping in and checking out the blog. Hm hm.. that's quiet interessting but honestly i have a hard time seeing it... wonder what others have to say..